The setting of this particular is some ten years or so after the end of DS9‘s run, or so is my understanding. There have been a number of great changes in the Bajor system since I was there last and its all quite fascinating. Benjamin Sisko is no longer Commander of the space station, which was destroyed a couple years back by a terrorist organisation known as the Typhon Pact. The wormhole is apparently closed for business. Kira Nerys is now a religious figure of some importance. Nog is now a Lieutenant Commander within Starfleet Engineering Corps and Chief O’Brien’s second for all intents and purposes, and so on and on. So much to get caught up on and so much to follow along. When the novel starts, this is all quite an information overload, but thankfully, for those first few chapters, David R. George III takes things really slowly and he builds his setup with a sedate grace that I could really appreciate. There are several stories going on here. There is the matter of the newly built space station that has been christened DS9 as well. There is the matter of Kira Nerys being lost, somehow, in the wormhole event and experiencing the first meeting of the Prophets with Benjamin Sisko. And there is the matter of Bajoran refugees elsewhere, where exactly, it is unclear for the most part. The real time events set aboard the space station are the best part of the entire novel by far. A lot of the familiar characters like Nog, O’Brien, Dr. Bashir, Quark, Odo and many of the others are present in this story thread and they ease the transition of returning to the series after such a damn long time for me. Given the enormous cast of the book however, it is not possible to spend enough time with them to really get to know them again, but the author gives the broad strokes, and that suffices for now. I would have loved to see more about some of them, but the larger story doesn’t leave any room for that. The story threat with Kira Nerys proved to be quite a rough one early on. My confusion with the opening of that story mirrored Kira’s own confusion at/of what was happening to her and it took a long time for both her and myself to adjust and understand those particular events. But once I got what the author was going for, this plot thread became very surreal and fascinating. I wish that the start to it hadn’t been so rough, because then I would have been able to appreciate it all the more. The third plot thread seemed tacked on and didn’t really connect with the main story in any way that I could see. Plus, it was never clear to me where exactly that entire story was taking place, so that added to the entire confusion I felt. There were some good characters here, but by and large, it just didn’t work for me at all. Overall, I quite like what the author did here, teasing out a huge story bit by bit. The only problem is that he does things a bit too slow and it got a little frustrating for me by the end since almost the entirety of the story was setup. There is a very big twist towards the end of the novel, and it is shocking as well. It is preceded by some really great character moments, all the more important since it shows the leaders of the governments of Bajor, the Federation, the Romulans, the Cardassians, and others all bonding with each other in way or another. 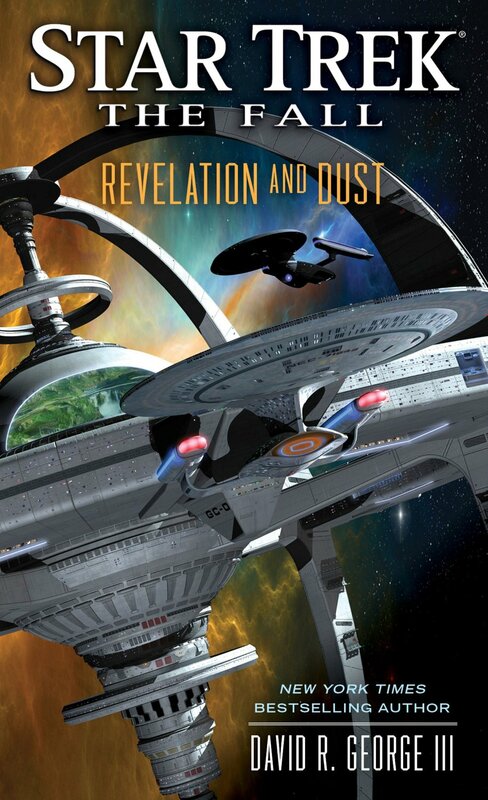 This emphasises the disruptive nature of the twist and I have to say that I am extremely interested in where the story goes next, in Una McCormack’s sequel to this novel, The Crimson Shadow, which is the next Star Trek novel on my reading list. Throughout the novel, one this was very clear to me: David R. George III knows the setting inside and out and he shows it again and again in this novel. It helps to add a sense of realism and validity to the novel. And in its own way, it becomes a defining element of the novel. Without it, the setting would have appeared somewhat bland and uninteresting, but since it is there, that is not the case at all. Overall, I’m fairly happy with this novel. It has some great characters, whether they are characters I’ve known before or those that are new to me. It has some really great character moments, such as the dedication ceremony of the new station that recalls those who died in the untimely destruction of the original, or the bonding between the original crew of DS9 from the time of the television series when they all gather together in Quark’s bar after the ceremony. And most of all, it tells a really interesting story from start to finish, despite all its flaws. I just wish the novel had been a bit faster paced, with less “baggage” and a somewhat clearer plot, but that’s really it. Posted on January 14, 2014, in Book Reviews, Review Central and tagged Aliens, Alternate Dimensions, Assassination, Bajorans, Book Review, Cardassians, David R. George, Deep Space Nine, DS9, Federation, Klingons, Pocket Books, Revelation and Dust, Review, Space Station, Star Trek, Star Trek: The Fall, Tie-in fiction, Top 25 Series 2014, Typhon Pact, Wormhole. Bookmark the permalink. 7 Comments.